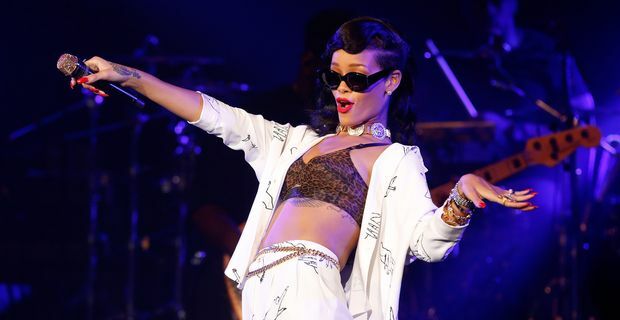 Rihanna shrugged off criticisms of her current promotional tour and new album with a storming show in London. Playing the Kentish Town Forum, a venue substantially smaller than the arenas she plays on her normal tours, Rihanna delivered a punchy and playful performance that enthralled fans and guests. Her promotional jaunt around the world has been a shambolic project involving six stops in six countries accompanied by an entourage of media and fans. The Berlin show was greeted with booing when Rihanna left it very late to appear on stage and appeared to forget some of her lyrics. There have also been chaotic scenes on board Rihanna’s Boeing 777, with journalists predictably enjoying the free alcohol and the singer refusing to do much in the way of promotion, instead hiding in her 'panic room' on board. One reporter, unsurprisingly an Australian, stripped naked and ran around the plane. The London show was a different story, with the singer in a happy and flirtatious mood as she mixed the hits with a couple of songs from the new album. She also made sure she finished in plenty of time to allow people to catch the last Tube home. She had a minor moan about some sound glitches during 'Where Have You Been' but was quick to laugh at herself and suggest it was the "bull***t of a rock 'n' roll tour." She played the crowd-pleasing 'Umbrella' and the new single 'Diamonds'. The show was on the same day as the release of her new album Unapologetic. By the time she was on stage at 10pm, the album had already topped the iTunes UK download charts. Unapologetic has been received dubiously by some critics, perturbed by lyrics that seem to dwell on her abusive relationship with ex-boyfriend Chris Brown, who also duets with Rihanna on one track.